Off to School with Ye! It was on this day, August 18th, in 1841, that an Address was delivered by the Rev. Dr. John W. Yeomans, on the occasion of the his Inauguration as President of Lafayette College, in Easton, Pennsylvania. John William Yeomans, D. D., was born in Hinsdale, Massachusetts, on the 7th of January, 1800. When quite young he served some time as an apprentice, but soon turned his attention to study and commenced his preparation for college under the direction of the Rev. Dr. Cummings, of Albany, N. Y. After the short space of a year and a half spent in preparatory study, he entered the junior class of Williams College, Mass. He graduated in 1824 with the second honor in his class, Mark Hopkins (who later served as President of that school), taking the first honors. For two years Yeomans was Tutor in the college, after which he studied theology in the Seminary at Andover, Mass. His first pastoral charge was at North Adams, Massachusetts, where he remained from November, 1828, till the spring of 1832, when he became pastor of the First Congregational Church of Pittsfield, Mass. In the spring of 1834 he was called to the First Presbyterian Church of Trenton, N. J., as successor to the Rev Dr. James W. Alexander. In the spring of 1841 he accepted the Presidency of Lafayette College, remaining there until the early part of 1845, when he became pastor of the Mahoning Church, in Danville, PA, where he continued in the discharge of his ministerial duties until his death, June 22, 1862. Dr. Yeomans was a deep thinker and a vigorous and able writer. He was regarded as one of the leading theologians in the Presbyterian Church, and as a metaphysician, he had probably but few equals among his brethren. The degree of Doctor of Divinity was conferred upon him by three different colleges at the same time—the College of New Jersey, Williams College and Miami University. In 1860 he was elected Moderator of the General Assembly. Talk about a guy you never heard of! Accorded such accolades, and yet today few if any know of him. Do the work the Lord has given you. Do it faithfully, to the best of your ability and as unto the Lord. And if you have yet to find your place in life, be faithful in seeking the Lord and His will. History will most likely not remember many of us, but that is not is what is important in this life. What is important is to first take Jesus Christ as your Lord and Savior. Be sure to be found in Him. And then be faithful in doing all His holy will, wherever you are in this life. All else is secondary. 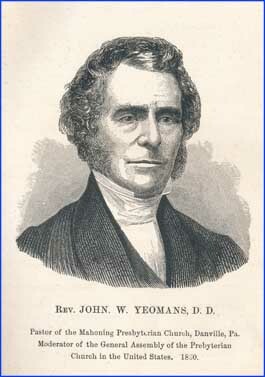 Image source : Engraved portrait as found facing page 36 of the 1861 edition of The Presbyterian Historical Almanac and Annual Remembrancer of the Church, edited by Joseph M. Wilson.